I gave birth to a boy! Multifocal motor neuropathy is rare disease affecting the peripheral motor nervous system. Presumably autoimmune, it is characterized by demyelination of motor fibers. The main manifestation - progressive asymmetric paresis – usually occurs in the distal extremities (especially the hands) and is known for its slow progression. In 10% of cases, weakness is more represented in the proximal arms or legs. In Russell’s case, weakness is distributed asymmetrically throughout the peripheral motor nervous system. Standard treatment: Intravenous injection of immunoglobulin and cyclophosphamide in more stubborn cases. Regression usually only in recently formed paresis. Long-lived defects often remain stable. Russell recalls first feeling weakness in the body in about 10-14 years old, when he felt that his body did not respond to commands from his brain. This feeling of "absence of body" was similar to the feeling achieved in yoga during deep relaxation but in his case it was not arrived at through intentional practice. Between 14-15 years old, his legs began new sensations, fasciculations (involuntary contractions of individual muscle fiber bundles) and later periodic rigidity. By 25-35 years old, the frequency of these sensations and symptoms increased and added one more - Russell began to feel fatigue, depletion and looked exhausted. The first time he went to a doctor in 1994, he had noticed that the ring finger on his right hand had stopped to completely unbend and start to affect his face washing. In 2001 he decided to show his hands the doctor and who ordered a blood test. The results showed an elevated level of anti-GM1 antibodies. Multifocal motor neuropathy is difficult to diagnose and is often confused with other diseases – usually amyotrophic lateral sclerosis (ALS). Russell also experienced a misdiagnosis except his doctors thought the issue was a pinched nerve in the elbow. Only after nine months did the neurologist understand the significance of his blood test. In December 2002, the Mayo Clinic in Rochester, Minnesota, conferred a diagnosis of MMN. In the beginning, an intensive protocol of intravenous human immunoglobulin (IVIg) was prescribed. Russell experienced no beneficial effect (neither improved strength nor reduced serum anti-GM1 antibodies) after the treatment. Subsequently, stronger and more toxic drugs were administered - Rituximab and then cyclophosphamide (Cytoxan). Once again, there were no positive results. By the time Russell met Professor Xu Mingtang, he had recently finished his cyclophosphamide treatment and walked with the help of two canes. He used a wheelchair to travel longer distances (to the supermarket, visits to museums, etc.) and, after each activity, he usually had to rest for two to three hours to recuperate. In 2005, Professor Xu Mingtang gave Russell seven sessions of Image Therapy in Seattle. After a few days of treatment, his hands’ function improved to a level he had not experienced in six months. Leaving the treatment room one day, Russell forgot he had brought (or needed) the canes he walked in with so he left them behind. But then gradually over 3 weeks after the treatments ended, his strength and vitality began to deteriorate and the improvements observed completely disappeared. The effect on his psyche did not – he had regained his sense of hope. In 2006, three more sessions in Seattle with Professor Xu Mingtang followed. However, it was clear that a more prolonged and intensive course of treatments would be needed for a more stable result. Xu Mingtang then invited Russell to Beijing for a personal research program. In June 2011, Russell came to Kundawell. He was using two canes to walk and a power wheelchair to travel the longer distances. After an eighteen day course of treatments there was a slight improvement in his strength and vitality. This was a major victory because of according to his illness’ characteristics, if the patient doesn’t take the standard drugs (none of which had helped him), continuous deterioration occurs. Hence, the victory was the fact that it was possible to not only to stop the deterioration, but to reverse it. Strength increased in his arms and legs. He could walk farther. He was less tired and he experienced less pain. Again, but after several months, his strength and vitality began to deteriorate. He returned to Kundawell for a second treatment in December 2011 and Russell began to feel better. There was improved function in the hands and feet and he was now able to lift both his arms above his head. The benefits of the Image medicine therapy continued after returning home. Three weeks later, Russell suddenly felt that his legs had more energy and improved ability to walk. He stopped using a cane for walking, did not use a wheelchair to travel intermediate distances and in January 2012 and February 2012 he briefly went skiing for the first time in two years. According to Russell, “Image Therapy has a distinctly different approach from Western medicine. There is no invasion of the body and no negative side-effects. While there may be pain and discomfort during the procedures, there is a cleansing of the body, an opening of the energy channels and the body is filled with energy and vitality. He also notes that qigong exercises help to maintain and gradually increase his vitality and energy. Xu Mingtang recommended to him the following exercises: "Big Tree," "The transformation of qi," "Breathing through the skin" and "Micro cosmic orbit." After his 3rd visit to Kundawell in late 2012, Russell did not remark any improvements to his physical strength. In fact, his physical condition continued to deteriorate. However, he and those around him remarked a notable sense of peacefulness in his demeanor. In July 2013, Russell received shamanic healing administered from a distance of over 8,000 km by one of Xu Mingtang’s students, Petra Groschupf. Within several days of the session, Russell experienced a return of increasing strength and vitality similar to what he had experienced after his second visit to Kundawell. He was elated. Russell continues to receive healing from Petra and continues to explore the healing ways and means of qigong. He hopes more people will step out of their comfort zones to try Image Therapy and to discover how qigong and Kundawell’s programs and services can give expected and unexpected improvements to their health and well-being. 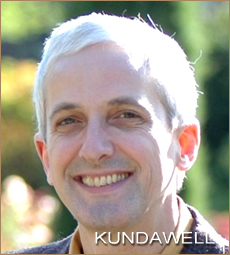 For those who need “proof” and “data” to substantiate the value and validity of Image Therapy, Russell has provided Kundawell with chart notes and measurements taken by Russell’s American medical practitioners. Between the first visit (July 2011) and the second visit (December 2011) to Kundawell, Russell had medical examinations at both University of Washington Medical Center and Swedish Medical Center for Outpatient Occupational Therapy where improvement in his condition was documented. He had noticeably regained strength during this time. But as Russell remarked, “These measurements are very limited, nobody can measure how reduced my pain was or what I previously could not do or get up stairs or how much time I need to take care of myself, get dressed, wash, wash your hair, work at computer, etc. 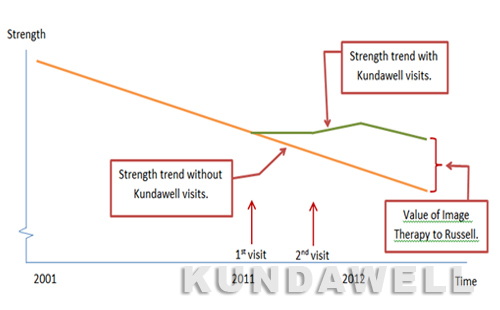 “They measured the difference between 2011 and 2012, but, if I had not gone to Kundawell, then starting from 2001, the decline of my strength would have been even lower. But I have experienced plateaus and even slight improvements. “When we collected measurements, we took them after the first visit to the Kundawell. The following chart reflects my personal measurements and benchmarks of my overall strength. An independent baseline from 2001 does not exist but according to normal progression of the disease, it declines relatively continuously. Russell has a high opinion about team of specialists at Kundawell. "All are good people and there are wonderful benefits of their treatments. “Xu Mingtang - a man, a healer, a businessman who combines the methods of traditional Chinese medicine, meditation level and uses an inner vision to see the body and the energy channels, uses herbs and drugs ("Live Fire," "Sea King"). I perfectly understand and feel his work. He works does his work when his brain is at alpha wave level where he receives important information and uses his deep understandings of what the best solutions are to resolve the problem. This method gives amazing results. “Lee Binlin - I believe he is an untapped resource, good hands and great strength. He is very talented and professional. “Olga has very good technique and a good knowledge of the body. She doesn’t use force like Lee but rather grace and wit.